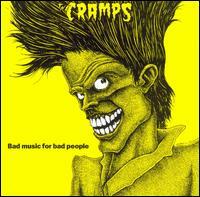 For probably about 25 years or so I have laboured under the false impression that the artist responsible for the hilarious and disturbing cover art on the Cramps compilation Bad Music for Bad People died of a heart attack at age 27. It’s an oddly believable story, but it’s completely untrue. The artist’s name is Stephen Blickenstaff, and he is alive and well. By a sad coincidence, Lux Interior, lead singer for the Cramps, died of heart failure last year. He was 62. It’s possible whoever fed me that story had Mr. Blickenstaff confused with someone else; if these admittedly sketchy details sound familiar to you as associated with another unfortunate individual’s demise, please let me know. Edited to add: the Cleveland Plain Dealer article that I linked to suggests that Interior’s heart condition was pre-existing; Wikipedia sources refute this claim.